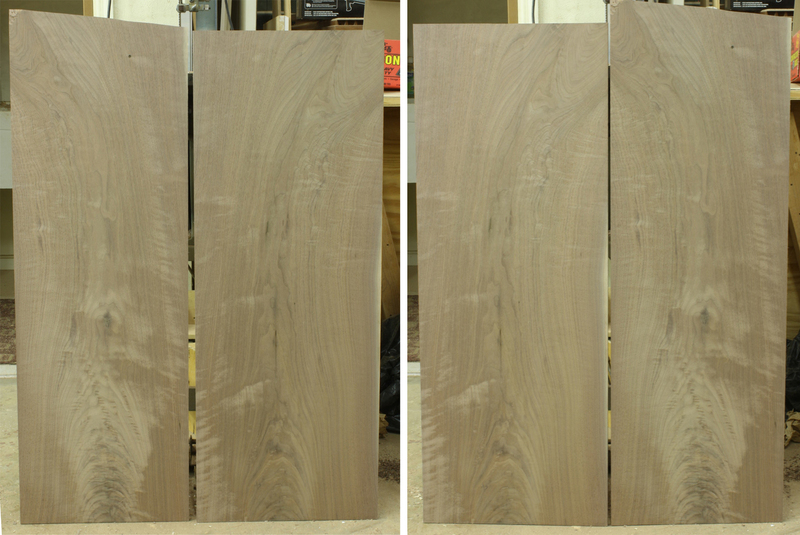 The two book-matched slabs pictured above are panels selected for my secretary tombstone doors. Take a look at the different arrangements. Which pairing looks best to your eye, right or left? Your response, for furniture construction, should be the pair on the right. Know why? When you look at furniture, you should try to direct eyes inward toward the middle of the piece, then upward. As you look at the left pairing, your eye is drawn toward the middle of the panels due to the grain. However, as you follow that grain up the panels your eye is pushed away from the center as the grain flows outward. The right pairing clearly has the opposite effect. As you travel up the panels your eye is continually directed toward the middle. This is correct for period design. In order to highlight the panel’s grain features and to find the best look, I position my completed frames on the slabs, then slide the frames around the panels. 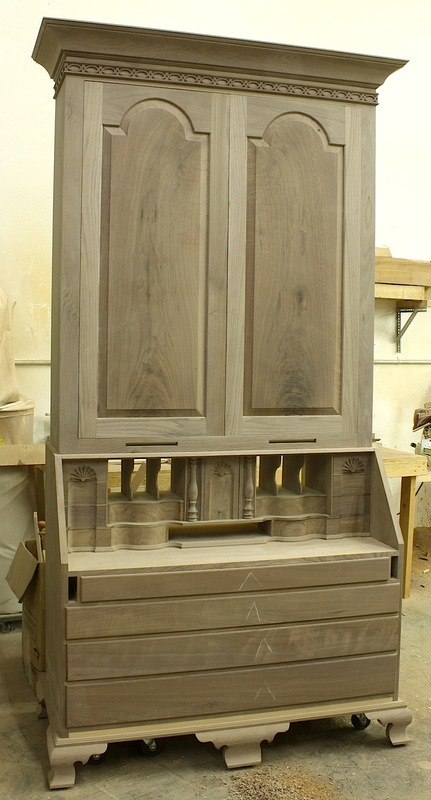 Because I was working with a pair of doors, I lined the two up side by side and worked to match the grain as best I could. When I had things set, I drew around the inside of the frames to mark each panel. 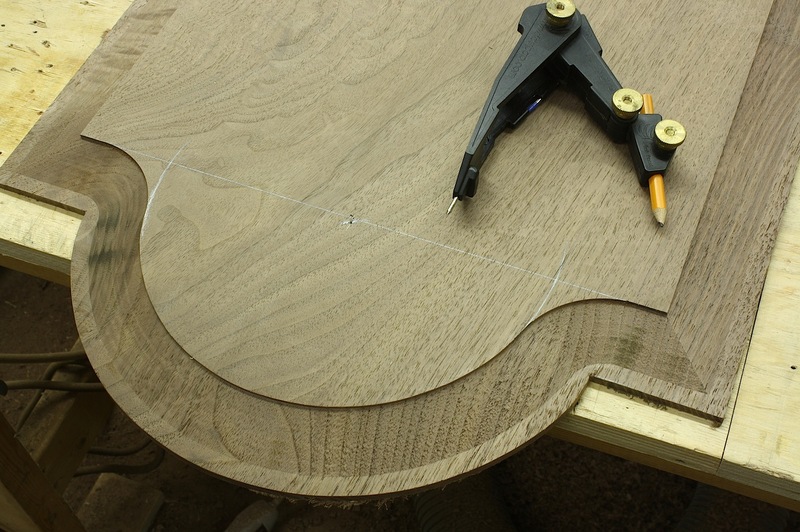 The final step to layout was to offset each line, including the arched top, by 5/16″. Panels were then cut to that size. To raise the panels, I turn to a router setup. This where using power tools makes the most sense, but there is also hand work that needs to be done before tombstone panels are complete. A router bit leaves rounded inside corners. It cannot create sharp turns. 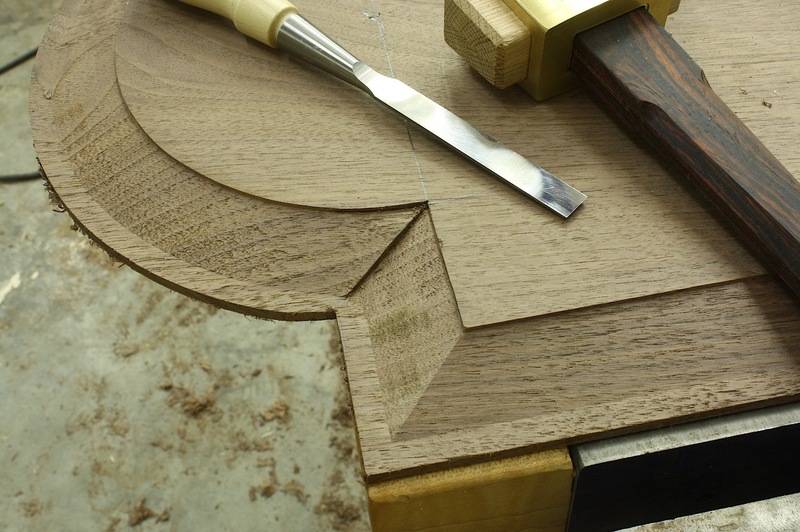 To finish up the panels, use a straight edge to pencil in the square shoulders, and a compass to set the round portion. Using a sharp chisel, set the lines just drawn to a depth that matches the reveal found on the balance of the panel. Pare away waste until the reveal is set. Next, after a line is struck down the slope and set in with a chisel, work the square portion back to your line by continuing the profile into the corner as shown in the left photo. To complete the rounded portion is a bit more tricky in that the profile is continued into the corner, but the area has to be on a continuous radius. Again, sharp chisels are a must, and you need to watch grain direction, too. (I also found that having a couple carving gouges – almost flat carving gouges – are great to set the rounded reveal lines, and to work nasty grain if necessary.) I’ll get the area as flat and clean as possible, then I’ll finish up with sandpaper. One additional note on my panels. Some tombstone panels achieve more than 180 degree bend, which looks unnatural. Others achieve the 180 degree half circle, then extend straight down a bit more in order to connect with the shoulders. I find both these examples distracting. To work out details prior to any shop work, I turned to SketchUp. 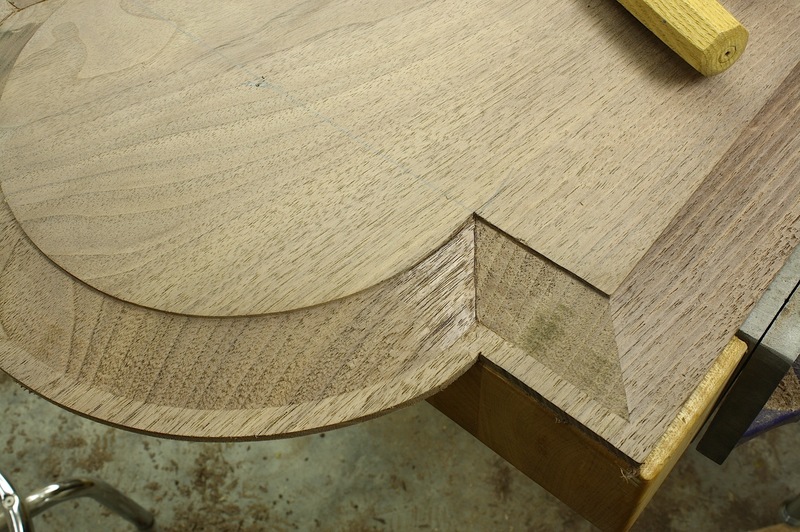 I designed the panels to have a full half-circle radius at the inside edge of the raised portion, then work outward to arrive at a layout for the top rails. Sometimes a little planning goes a long way.